Via MediaLite: Wynn Las Vegas put out a press release with the odds of winning for each of the new couples on Dancing With the Stars. In last place, at 35:1, Bristol Palin and Mark Balas. MediaLite makes a good point about why Bristol may not be sent home as early as some think: Sarah Palin’s Facebook Friends could keep her in. A big part of the elimination process is fan voting. You don’t think Sarah Palin can use the power of her Facebook page to mobilize support for her daughter’s cha-cha? In third place, the couple I’ll be rooting for: Jennifer Grey and Derek Hough. Too funny. The cast for the upcoming season of Dancing With the Stars was announced today. 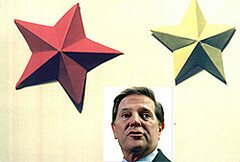 Making the cut: Former Congressman Tom DeLay. DWTS will feature its first politician — former Congressman Tom DeLay— on the season's Sept. 21 (8 ET/PT) premiere. DeLay, 62, served as House Majority leader until he was forced to step down following a 2005 Texas grand jury indictment on money laundering charges. Known as “the Hammer” for his dealing with political opponents, the polarizing Republican's legal woes remain unresolved. The winner will be chosen tonight on Dancing With the Stars. My vote: Melissa and then Gilles. Who I think will win: Gilles, but I’m not counting Shawn out because she has been terrific the past few weeks, especially last night. Gilles is really hot, but too often his dancing seems to be more about Cheryl than him. Len pointed it out last night, but I’ve been thinking that for a while. Melissa is the best dancer of the three, by far I think. Shawn has the gymnast thing going which may make her appear better than she really is. Go Mel! It’s the final competition on Dancing With The Stars. All of the three finalists are incredible tonight. My favorite is Melissa, but Shawn and Mark’s free-style was incredible — and Gilles is really good. The judges didn’t love her free-style but they still gave her “9”‘s. So she’s still in the running. This seems like it will be the closest year ever. Considering Melissa only joined the show four days before it began airing, just getting to the finals is such an accomplishment for her. Here’s an interview today with Melissa and Tony.